We’ve got a lot of requests for updates on our last month report which showed Surface as the most popular Windows 8/RT device by far. And we are happy to oblige. The bellow stats are based on data collected from 71 active Windows 8/RT apps on AdDuplex network over the day of December 7th, 2012. Surface is still the most popular device, but its lead is not as stunning as it was last month – down 5% to 6% overall this month. It’s followed by 3 inexpensive notebook models from HP. 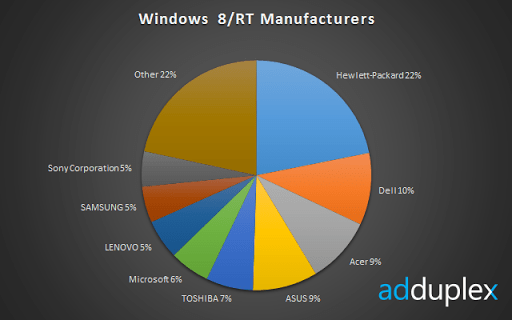 Surface’s direct competitor – ASUS VivoTab RT is at #8 with 1%. 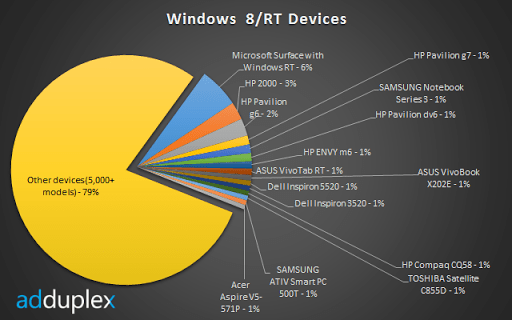 Overall we’ve registered more than 5,500 different Window 8/RT devices (up from a little over 3,000 last month). On the manufacturer list HP strengthened its lead and Microsoft dropped from No.2 to 6. That isn’t surprising since OEMs didn’t rush to market all that much. Plus a lot of people upgraded their Windows 7 machines and, obviously, none of them were made by Microsoft. Last time we looked at the way the apps were used on all of the devices. Considering that the majority of devices are either traditional laptops or even desktops it didn’t make much sense. 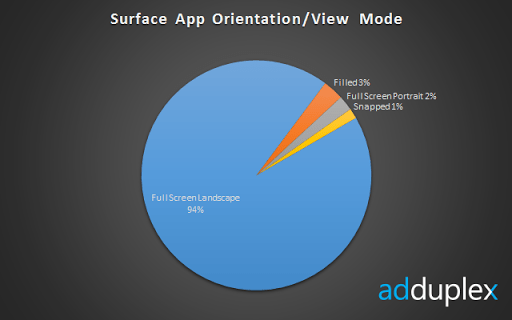 This time we decided to isolate this metric for Surface only. The result is that portrait share grown from 0.32% to 2.10%, but other than that it didn’t change the overall picture. The overwhelming majority still uses the apps in full screen landscape mode.